Leisure Services covers culture, sports, library, youth services and communal work. Leisure services are part of general well-being services which promote the overall welfare in municipality. 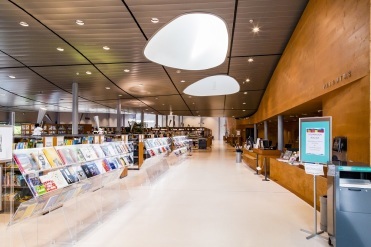 The Hollola library is a center of information, culture and events. It is open to everyone. The library offers books, newspapers, music, DVDs and many other items to borrow – even board games and sports equipment. You can read newspapers and magazines, visit exhibitions, study, practice music and use a computer. Or you can just spend some time there, enjoying the luminous space and atmosphere. In the main library lobby, you can also sip a cup of coffee or play a round of pool. Hollola offers good conditions for exercise and sports. Hollola's Sports Services maintains and develops the municipality's sports facilities and conditions.Hollola's wide range of sports and exercise activities are organized by sports clubs, and they are assisted and supported by the Sports Services. The Sports Services organizes guided exercise groups for specific groups. Hollola offers different exercise groups for customers. Water exercise groups are open for everyone and swimming schools are offered mainly for children. Hollola actively enforces health-promoting physical activity and exercise counselling. The swimming hall, ice stadium, sports halls, school gyms, sports fields in different neighborhoods, beaches, tennis courts, shooting ranges, motor racing track and various outdoor trails are all intended for physical activity. You can get more information about hobbies, sports facilities, sports clubs and their activities, fitness exercise and sporting events from the Sports Office. Open from 8 a.m. to 3 p.m. The municipality of Hollola's Youth Services aim to support the growth of children and youth and to strengthen their civic and social skills. The Youth Services organize guided activities, camps, targeted small-group activities and various events in collaboration with other operators. Outreach youth work is special youth work, the purpose of which is to look for answers together with young people to questions troubling them and to help them find the services they need. Youth workers lead one special lesson a week about interaction and human relations skills for all 5th graders at schools. According to the Youth Act, young people must be given the opportunity to take part in the handling of matters concerning local and regional youth work and youth policy. Young people must also be heard in matters concerning them. The channel of influence for young people in the aforementioned matters is the Youth Council. Leisure Services is doing communal work. There is a cafeteria in main library open for all customers. Cafeteria offers theme days and other activities. There’s a screen inside the cafeteria which presents information about activities from many different non-governmental organizations. There are similar cafes at Vesikansa and Hämeenkoski schools which are open on certain days per week. At summer time, there’s children’s play area in main library where you can leave kids while shopping from Monday to Friday 10am until 5pm. Playing-time for each child is two hours per day. Children’s playing area is free of charge. Cultural work is an essential part of the field of leisure services. Active co-operation with third sector operators guarantees a culture offering which is pervasive and serving all citizens. Leisure Services arranges theatre camps for children and youth, art exhibitions and yearly public events at plaza such as Good Feeling day and August Autumn Fair. Additionally, theater visits and music concerts are organized in schools and libraries. There are active summer theatres in Hollola region (Honkalinna summer theatre, Heinsuo summer theatre). Homestead museums of Hollola region can be found from Hämeenkoski and Hollola parishes. Municipality of Hollola owns a wide collection of artwork from artists of Päijät-Häme County. The biggest individual collection, which consists of over 100 artworks, is from Liisa and Timo Ruokolainen who donated it to municipality. The collection has sculptures and paintings, as well as ceramics. A changing exhibition has been designed for the art collections of municipality of Hollola into the lobby of municipal office building and to the municipal council hall. Hollola Main Library, photo Janne Bröijer. 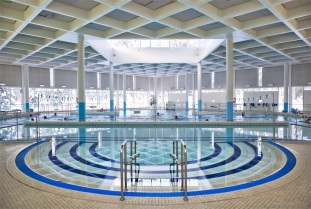 Swimming Hall is located in Terveystie 8.